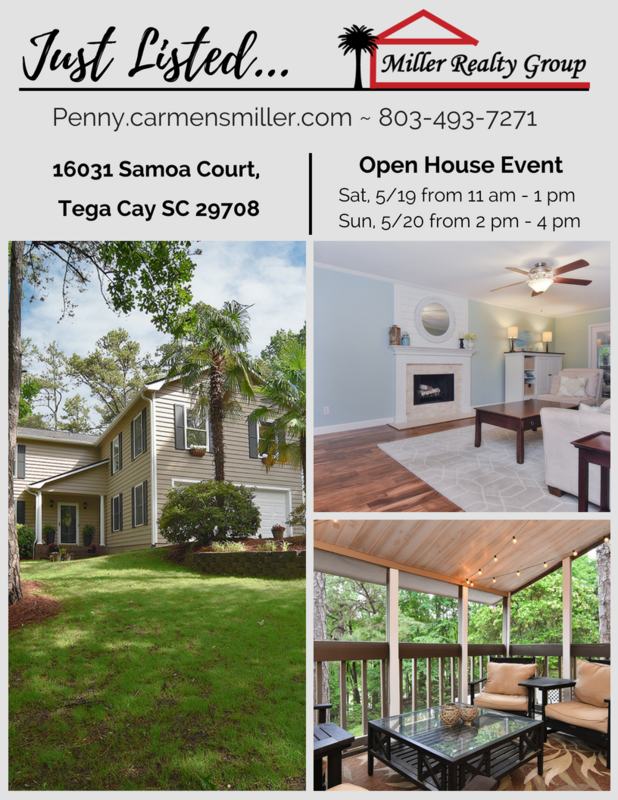 You are here: Home / Tega Cay Homes For Sale / Just Listed ~ 16031 Samoa Court, Tega Cay SC 29708 ~ Open House Sat/Sun! Just Listed ~ 16031 Samoa Court, Tega Cay SC 29708 ~ Open House Sat/Sun! Open House being held May 19-20 ~ Sat 11:00 am – 1:00 pm and Sun 2:00 pm – 4:00 pm. Enjoy?views of the golf course from the screened porch or deck overlooking the Cove hole #9. Freshly painted. New roof Jan 2018 with 50-year transferable warranty. Charming 3 bedroom/2.5 bathroom on quiet, cul de sac street. New acacia wood flooring throughout main level & master. Kitchen with tiled counters/backsplash & new stainless steal appliances. Large master suite with fireplace. Spacious secondary bedrooms. Huge bonus room with separate stairway entrance. Mature landscaping with beautiful palms, azaleas & camellias. Storage building. Fort Mill Schools. Tega Cay vacation lifestyle. See more details here or Contact Penny Sheppard to schedule a private showing today! 803-493-7271 or visit her website at Penny.carmensmiller.com.